« Kudos to MSG on Giving the Isles Some Love! Is Stoops primed for a National Championship this fall? I know its only late May, but College Football is coming, and it can’t come any faster. With the end of the Spring Football season in the last few weeks, many top publications have come out with their Post-Spring Top 25. Also some other people are already making their predictions officially for next season. Today I will look at the ranking of teams in the average of many Top 25’s and tell you who I think is a contender, who is underrated and who is vastly overrated. First, lets look at this “average” top 25. Once again, this is not my top 25, it is an average of many top publications like ESPN, SI, and CBS Sportsline. So there you are, now lets discuss. The top of the rankings are actually something I don’t have a problem with. #1-4, as in Alabama, Oklahoma, LSU and Oregon are all in the right place, and could all be interchangeable in my opinion. Oklahoma and Oregon have a much easier path to going undefeated, while I think Alabama and LSU are just as good head to head. Now lets look at who is overrated and underrated. #5 FSU- Ranked as high as #3 by some people, the Noles are getting hype for some of the wrong reasons. While they have talent and finished well last year, they are getting alot of hype from the recruiting trail. The Noles had the top class this year, but its not like true freshman are going to make them a top 5 team. Losing Christian Ponder is considered not that big of a deal, and it shouldn’t, but EJ Manuel isn’t as good as people make him out to be. The Noles will be good, and I think they are the best ACC team this year, but the Top 5 is too much, for now I consider them a 10-15 ranked team, but that can change if they beat Oklahoma. #6 Oklahoma State and #7 Texas A&M- Maybe this pair of teams I’m wrong about, but I just don’t understand the hype here. Sure they return plenty of players from successful campaigns last year, but neither were as good as their record last year. Oklahoma State probably has better reason to think they’ll be a top ten team, but I never bought into them being quite that good last year. The good news is the schedules are workable for both to win 10 games, but I’m not convinced they can do it. #20 Auburn- Let me be the first to tell you, Auburn is going to be very mediocre this year. They lost everyone, I mean everyone. Making things worse the schedule that helped them win the National Championship last year, is now flipped so they have to go on the road for many many tough games, minus Bama. Don’t get me wrong, they aren’t bad and will likely be great again next year, but the schedule is too much. They won alot of close games last year, most at home, and this year I see that being flipped and the Tigers winning on 6 maybe 7 games to qualify for a bowl. I wouldn’t be shocked at all if they finish 5-7 either, that’s how bad the schedule is. #25 Utah- Of the conferences who made realignment moves, the Pac 12 is the one that got the least value in athletic prowess. This is the best program they added, and I’m not convinced it’s going to be that great. Sure Utah is a good solid program that plays solid defense, but can they win 10 games with their new schedule. The good thing for them is, the Pac Ten has been down for a while now, and Utah is lucky to miss Oregon this year. Still they play Pitt and BYU, both on the road, OOC, and still have some tough games to win in the new conference. I just don’t see the Utes as a top 25 team this year. Somewhere in the 6-8 win range is what I’m seeing. 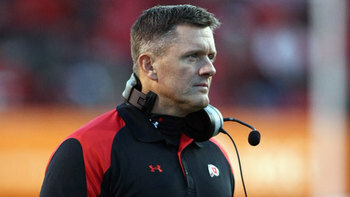 Is Utah and Kyle Whittingham ready for a much tougher schedule in 2011? #21 Virginia Tech- Maybe Virginia Tech deserves this ranking because of what they lost from last year, but they certainly are primed to win alot of games this year because of a very forgiving schedule. The Hokies actually play 6 road games this year, but the only one (or two) they even have a chance of losing should be Georgia Tech (and maybe ECU), which they should win anyway. At home they play some tougher opponents like Clemson, UNC, and Miami, but should easily be favored in all three. Maybe Virginia Tech isn’t as good, but I can’t help but believe they’ll easily win the majority, if not all of their regular season games this year. #23 Georgia- Call this judgement “year” for Mark Richt. He should be happy he’s got a chance to do something with the favorable schedule. Georgia gets some of their tougher games at home and should improve as a whole from last year when they showed glimpses of something good. AJ Green is gone, but I believe the Bulldogs could compete for the East this year, and the big game to decide that is on their home turf, against South Carolina in week two. Florida should be better too, and that game could go a long ways as well. (NR) Florida- The Gators are talented and last year went through so post Tebow pains. When you don’t have him at QB, you can’t run the offense the same. Luckily things are different now and I expect a more classic SEC team this year. They’ll run it at you, and they should be very good defensively. I think the Gators make the jump into the top 25 this year, and they could compete with Georgia and South Carolina for that division title. Maybe 8-9 wins is more of the expectations, but that would be a good start for Muschamp. Notre Dame also has a favorable schedule, but that doesn’t deem them under or overrated at #15 in the polls. South Carolina can be grouped there as well (favorable schedule), but with all the Stephen Garcia nonsense, its hard to pin down how they will pan out. This entry was posted on June 7, 2011 at 9:46 am and is filed under College Football. You can follow any responses to this entry through the RSS 2.0 feed. You can leave a response, or trackback from your own site.